One of our readers and a good friend of mine, Dayton, requested a story on the different ways of doing a road trip in the US: staying in a tent, staying in an RV and staying in a hotel. We have done all three and, believe it or not, I keep detailed records of how much everything costs. First and foremost, let’s talk about our main trip finance tool: Trail Wallet. We have used Trail Wallet for years, tracking all of our major trips since our trip to Italy in 2013. 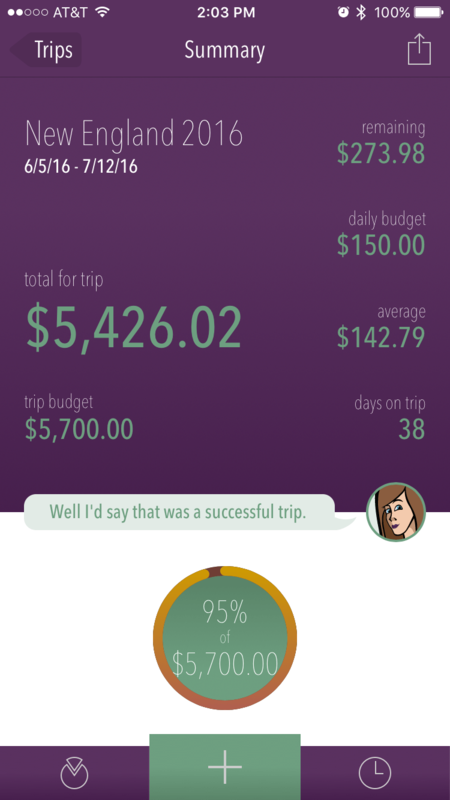 Road trip or not, this app is a great way to track your expenses! Trail Wallet is one of the apps we use while on the road to keep us under budget… And to help budget future trips! It allows you to set up categories, input transactions in multiple currencies. And, exchange rates update daily if you have a data connection. The only thing it doesn’t do, in terms of transactions, is let you take pictures of your receipts. When you set up a trip, you can choose an total budget or a daily budget. If you choose a total budget, once you put in the dates, it will calculate how much you can spend on a daily basis based on how long your trip is. This app is great when you are out on the road, but it does a require a little discipline in terms of making sure you enter every transaction. Once you are home, you can look at how much you spent on average per category. You can then use this to plan future trips of all kinds, not just road trips. On to the road trips! We took all three of these trips in our 2012 F-150, so we are truly comparing apples to apples in terms of fuel efficiency. Obviously, fuel prices have fluctuated, so you do have to consider that. Our last big tent camping trip was to out to Wyoming back in 2014. It was 30 days long and we covered 6,790 miles. For that road trip, we spent $3,146.04, an average of $104.87 per day. Accommodations accounted for $13.53 of that daily average. BUT, we spent 10 out of those 30 days in hotel rooms that we paid for with Hilton Honors points instead of cash, two in a dorm room in Lincoln and one night we actually paid for (paying $80 for a Hilton Garden Inn was better than using points). We loved staying at an Army Corps of Engineers site on Council Grove Lake, Kan. that only cost $10. That means we only camped 16 of those nights, paying an average of $21.80 per night in campsite fees. Unfortunately, I don’t have access to how many points I spent during that trip… Hilton Honors only goes back so far in terms of stay information. I would guess that we spent around 15,000 points per night, on average. Nerd Wallet values Hilton Honors Points as $0.005 per point. Thus, we averaged about $75 worth of points per night. That would have driven our per day cost up to around $43.53 per night for accommodations, adding about $900 to the overall trip and increasing the per day cost to $134.86 per day. The F-150 typically gets around 18-20 mpg on the highway when it is not pulling the camper and each mile we drove cost us around $0.19 per mile for a grand total of $1,301.53. Obviously, gas prices play a significant part in the cost equation. Last winter, we headed West again, visiting Wyoming, Montana, Idaho and Colorado over Christmas Break. We spent 16 days on the road, driving 5,967 miles. You just can’t camp in the winter in the Northern Rockies. This was taken on Christmas Day in Montana. For that trip, we spent $2,274.56, an average of $142.16 per day. Accommodations accounted for $29.37 per night. Since it was a winter road trip, we did not camp at all, staying in hotels every night. We spent 190,000 Hilton Honors Points and $469.87 for hotels for the trip. That averages to $93.97 for the five nights we paid for and 19,000 points for the nights we used points. 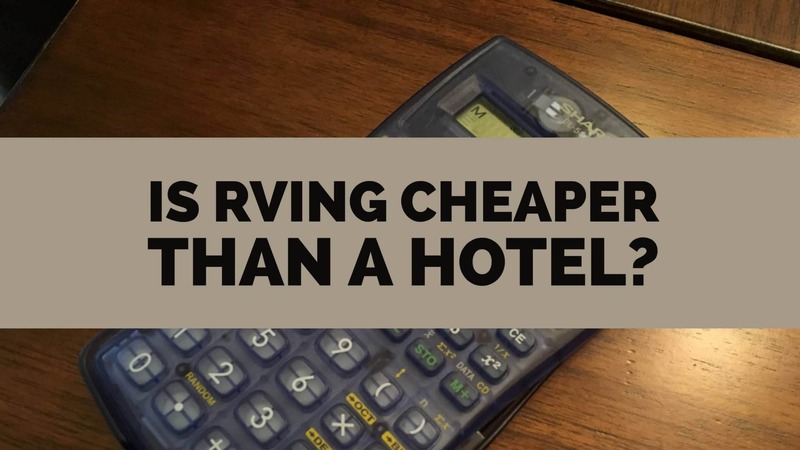 Assuming we paid the average for hotel rooms instead of points, we would have spent nearly a thousand dollars more, driving our per day expenses up to $200.89. Ouch! Our fuel cost on this trip was a bit more than $0.11 per mile for a grand total of $667.63. On our first major road trip with the camper, we spent $5,426.02 over 38 days, spending an average of $142.79 per day. We drove 6,690 miles, towing the trailer for a large portion of those miles. One of the best parts of RV camping: sleeping in YOUR bed every night. We stayed in RV campgrounds every night, so no freebies for us! Our campgrounds cost $1,726.37, an average $45.43 per night. We are hoping, going forward, to keep our per night cost to an average of $40. Even if we were to add the RV payment and the increased cost of gas into the cost of spending the night in the camper, we are still looking at $60.80 per night. That’s a pretty big savings over hotel rooms AND you get to sleep in your own bed every night. The truck gets about 10.5 mpg towing the camper. Amazingly, we spent $1,149.66 on gas, which amounts to $0.17 per mile. Obviously, gas prices played a huge role in the difference between this trip and the 2014 road trip, but gas prices this summer were fairly comparable to what we paid over Christmas Break. I know there is a lot of math and numbers in there, but here is the bottom line: In terms of the cost of a road trip, tent camping is a lot cheaper than RV camping, which is cheaper than staying in a hotel. Yes, there are equipment costs and additional fuel costs with camping. Even then, camping in an RV is about 1/3 cheaper than getting a comfortable (Hampton Inn or Hilton Garden Inn) hotel room. Add in the fact you can cook your own food in lieu of going out to eat, can store perishable food in the fridge and only have to unpack your clothes once, it becomes an even better deal. As I was working on this article, I was going through old trip posts from the 2014 trip. We talked about how we might need to get a travel trailer sooner rather than later because our backs just can’t handle sleeping on the ground. I’m very glad we took the plunge. For the RV you need to add the cost of depreciation to each night. If you only use the RV 30 nights a year it is very costly. For a $30,000 RV if it only depreciated 10% per year that would be $100 per night. Not many get four weeks of vacation to use the RV on road trips. We balance between hotel and tent camping. Thanks Rick. I certainly agree depreciation should be a factor in ownership, but it should also be a factor in owning a car as well. 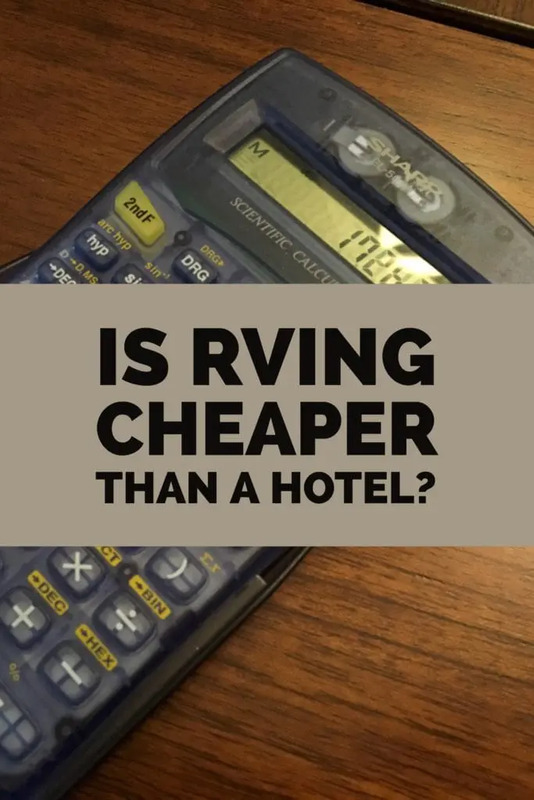 The calculations for how much a camper depreciates are pretty messy when you start factoring in the kind of camper, etc., and I find the tax benefits of treating the camper as a second home outweighs a lot the depreciation. Still, you are correct that, for anyone who cannot get away very often, an RV is not the best investment. Another comparison, and a very good argument for camping is to compare a week’s worth of camping to renting a cottage for a week. Here in the Northeast, (e.g. Maine, Cape Cod, CT shore), expect to pay about 1200 – 1500 for a cottage for a week. That gets you your own kitchen, beds, etc, but you have to bring your own linen, towels, foods (which you either need to bring by cooler, or spend an evening shopping). You are also limited to a Sat to Sat or a Sun to Sun stay. That is a killer for a commute. If you bring a camper to a campground, expect to pay about $50/night. But we have the advantage of going from a Friday to a Monday, thereby missing the weekend turnover and having a couple of extra full days to relax. Our camper’s fridge and pantry are already full, so grocery shopping is minimized. Also, the beds are already made, the clothes are already hung up, etc. At a campground, you have the additional bonus of neighbors who share a lot of the same interests as you. We have always been very happy with the groups around us. And finally, we use the pickup truck to tow the camper, but we bring the minvan to travel and do sightseeing. (better gas mileage, more space, etc). Thanks so much! Couldn’t agree more! Is anyone counting happiness points here?? In my camper I can cook, shower in my clean tub..sleep in my own bed…my animals have their own space, toys etc…its like living at home without being there. This to me is more important than saving some money. If you look at hotel and meals out..rv living still has to be cheaper…plus I’m a pretty good cook so the food coming out of my kitchen is way better for you and more cost effective!! Count me in as a happy 5th wheel owner!!! We 100% agree, Wanda! We would much rather be staying in our camper than a hotel, well, because it’s our home away from home. But happiness points are hard to quantify for the budget-oriented folks out there. I just found your story while looking at Pinterest and it hit home for me. We are trying to decide between tent camping, cabin rentals in VRBO and a little RV. We camped and did VRBO this summer for 33 days. We were in Panhandle of FL, Georgia, North Carolina and Tennessee. We had to continually put tent up and down and try to keep our food cool but secure it nightly from possible bears. The RV sounds expensive but it sure sounds more comfortable for sleeping and fior our puppy. Thanks for sharing your trip and the numbers. Thanks so much, Mari. While we have found it is more expensive than tent camping, the comfort outweighs the cost of a travel trailer. That said, we already had the truck and only had to make minimal improvements to get it ready to tow. We cheated there.Bought the truck with the intention of towing an RV one day. And then didn’t let sales folks talk us into too much trailer for the truck. Our #1 point for the RV was taking the puppy with us. Though I do find that many places don’t like German shepherds. That’s awesome! We bought our first truck with the intention of being able to tow a trailer but had not thought about being able to tow an RV, so we didn’t get the max tow package. We made sure to get that for our new truck and love it. Many of us do not already own a truck. This adds to the math; depreciate the added cost of truck and camper, compared to the car. If you can keep truck and camper at $50,000; an RV 60 nights a year; then RV is about even with staying at a motel. Of course, there may not be a motel near where I would be staying in an RV. I agree, Michael, that owning a truck is an important part of this equation. Unless you are just using the truck to tow the camper, you are getting more value out of the vehicle than just towing the camper. Our truck is our daily driver and we use it for a lot more than just towing the camper, which reduces the truck’s cost in the equation. Just found this post on cost comparison and it is right where I am currently. We have had a travel trailer for three years now and before that we tent camped. But recently I have been trying to reduce cost. We took a trip this last summer for three weeks in the TT that was well over $2000, the vast majority was cost of fuel. One of the mistakes I made when we bought our trailer was I didn’t consider the massive air dam front end on the trailer going down the road it just kills my gas mileage, and if there is a head wind it’s horrible. Our trailer is 28ft long and about 1 to 1and half feet wider then our tow vehicle on each side, just massive amount of air pushing back against the trailer. Bottom line we are considering going back to tent camping and are researching ways to make it more comfortable like using cots to get off the ground that kind of thing. We also are considering a smaller trailer such as a teardrop that has far less wind drag being towed. Thank you for you comparison insight. Kurt, we agree on the gas mileage. It is about a 50% loss for us… Down to 10-12 mpg. If I were looking at a teardrop for my wife and me, I would make sure it had doors on both sides. Another option (one I still kinda fantasize about) is one of the R Pods. They are a lot smaller and lighter than our trailer. The big thing we would lose is the walkaround queen bed. There’s nothing worse than having to climb over someone to use the bathroom in the middle of the night. If you are thinking about a smaller trailer, you can look at pop-ups too. They are not the air-dam a TT is, they can have as many amenities as you want. The small teardrops can get pretty cramped if you are in it for very long, but if only using for a place to sleep, they work. You don’t need as large a vehicle for towing them as you do for a trailer. We have a Tahoe as our daily car, so it is not an extra expense for us. Our 19 ft trailer with 1 slide-out is perfect for our 5-6 week trips (retirement has it’s advantages) but would not be big enough for more than 2 people. We 100% agree with your comments. We boondocked a bit this summer. While we had some good experiences, we also had one of the worst nights ever at a Walmart parking lot in Evanston, WY. There were around 100 or so semis idling all night. One of the biggest reasons we didn’t get a pop-up is camping in desert areas in the summer. We don’t do it much, but you can’t get to California from Georgia without going through the desert. For someone who doesn’t need to worry about that, it is a good option.